The BR-355-S4 GPS Receiver can be utilized in a variety of applications which require GPS signals to be received and decoded in your Windows laptop or tablet PC, and for Mac users, their Mac Books or Mac Book Pro's. Compatible with most all NMEA compliant third-party software, the BR-355-S4 is suitable for use in vehicle, marine and aviation navigation, as well as commercial and municipality applications such as fire trucks, police cars, buses, GIS data collection and much more! The BR-355-S4's slim profile housing has a IPX7 water resistant rating, and incorporates an active patch antenna for the highest level of GPS accuracy. 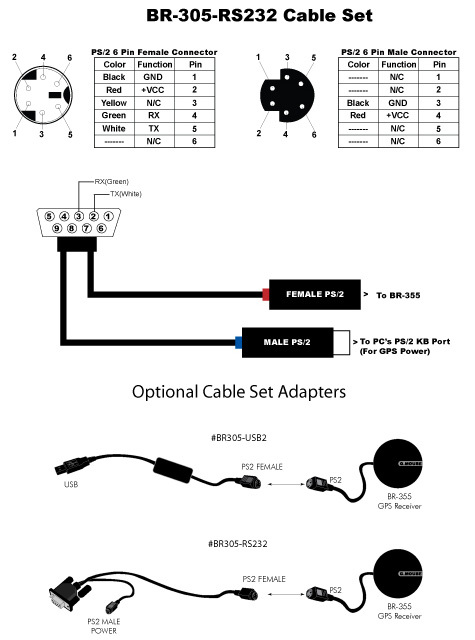 The BR-355-S4 requires either the USB, or Serial RS232/PS2 cable sets to function (sold seperately) via USB. Placement of the GPS receiver anywhere within the vehicle will usually get sufficient GPS signal reception, but in those rare occurrences when towering high-rises offer challenging satellite reception, simply place the BR-355-S4 on the vehicle's roof (attaches with its built-in magnet) for improved reception. Since power is transferred through your PC's USB port or the keyboard port, depending on which cable set is connected. Data is also transmitted to the USB port or the RS232 port depending on which cable set is used. For Full Specifications please click here.